1/25/10: Roger is a 51-year-old police officer who has been seeing the same dentist for over 20 years. He hasn’t had any decay in the last 9 years and has two risk factors. He takes a medication for high blood pressure and likes to drink 2 diet sodas a day while on the job and drinks 2–3 alcoholic drinks every night. 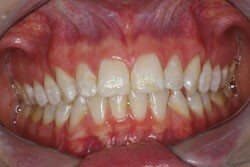 His dentist had just recently started performing caries risk assessments and CariScreen testing. Roger’s first CariScreen score was 4125. Both he and his dentist were a little surprised at his biofilm challenge as he has had very good oral health throughout his lifetime. His dentist made some therapy recommendations, but as Roger has had good oral health and didn’t feel his risk factors were “that bad,” he opted not to make any therapy changes at this appointment. 8/6/10: Roger returned to his dentist for his next checkup, and none of his risk factors had changed. His CariScreen score at this appointment was 9889. At this point, the dental practitioner recommended a professional rinse and gel. The combination of the two products included antibacterial therapy with 0.2% sodium hypochlorite, pH neutralization, 1.1% neutral sodium fluoride, xylitol, and nanohydroxyapatite for remineralization. His dentist, who had known Roger for a long time, informed him that he had a 38%–69% chance of decay in the next 12 months, and he was concerned that at his age, something could change and he would start developing decay. Roger thanked his “doc” but again opted not to make any home care changes at this time. 6/10/11: Roger missed his regular 6-month appointment scheduled in February for unknown reasons. At this checkup, he did not share any new risk factors and marked his risk assessment form with the same two risk factors as before. His CariScreen score was 8227, and he had 4 new cavities. His dentist asked him if there had been any major changes in his life or any health concerns since his last appointment. Roger shared that he had hurt his back around Thanksgiving of the prior year and had been on pain and muscle relaxant medication for 3½ months while his back healed. But he wasn’t taking the medications anymore. During that time, Roger had experienced minor dry mouth but hadn’t changed any of his other eating or drinking habits because of it. 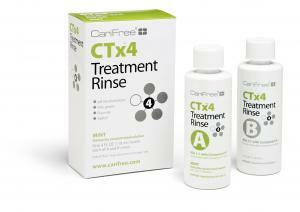 His dentist recommended he get his cavities filled and again recommended a home care change with the combination of the two products with antibacterial therapy, pH neutralization, 1.1% neutral sodium fluoride, xylitol, and nanohydroxyapatite for remineralization (such as CTx4 Treatment Rinse and CTx4 Gel 1100. Roger decided it was time to follow his dentist’s advice and began the therapy regimen. 12/15/11: Roger returned for his 6-month checkup and informed his dentist he had been using the therapy products 2 times daily for the last 6 months as he had recommended. The two risk factors of antihypertensive medication and drinks other than water more than 2 times daily were present. His CariScreen score was still elevated at 3460, but he had no new cavities. His dentist also noted that his gums looked healthier. Roger is still using the prescribed homecare regimen daily. 5/16/11: Jennifer is an active 32-year-old mother of 2 and works as a paralegal. She has not had any issues with dental decay since she was a child. 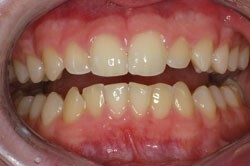 When she was 5 years old, she had three fillings in her primary teeth but has had no issues since. She ran track in high school and has always enjoyed distance running. She has had the same dentist for 12 years. On her first caries risk assessment, she had two risk factors, frequent snacking and drinks other than water more than 2 times daily. She had a CariScreen score of 5870 but did not have any cavities at this appointment. Jennifer’s dental professional shared with her how the snacking and drinks increased her risk for dental decay and that her high CariScreen score was a concern. Jennifer responded that she was preparing for her first half marathon, and part of the preparation included a frequent intake of protein and carbohydrates. Also while running, she focused on maintaining her hydration and energy level by consuming sports drinks and small packets of honey with caffeine in them. As she was dedicated to her sport and felt the diet and drinks were necessary, she was not willing to make changes to her risk factors. She was concerned about her biofilm challenge and, as an individual who focused on making healthy choices, felt adding the prescription/professional home care products to her dental home care program was the right choice for her at this time. She decided to follow her dental professional’s recommendation and start using an antibacterial rinse with 0.2% sodium hypochlorite, fluoride, xylitol, and pH neutralization, followed by a toothpaste/gel with 1.1% neutral sodium fluoride, xylitol, pH neutralization, and nanoparticles of hydroxyapatite 2 times daily. She scheduled a follow-up appointment in 3 months to reassess how her therapy choices were working. 8/21/11: Jennifer returned for her reassessment appointment, and none of her risk factors had changed. She had finished her first half marathon over the summer and was training for a full 26.2-mile marathon. Her CariScreen score at this appointment was 7762. Initially, she thought that maybe the therapy hadn’t been working. But upon further discussion, she shared that her meals and drinks intake had increased with her workout increase. Her dental professional also shared that unless the risk factors were decreased, it might take multiple therapy cycles to lower her biofilm challenge. Second, if Jennifer added any additional risk factors while her biofilm challenge was so high, decay might develop. Jennifer chose to continue with the therapy and began another 3-month cycle. 11/17/11: Jennifer returned for her 6-month recare appointment. Nothing had changed with regard to her risk factors and lifestyle. Her CariScreen score was 4736, and she had no new decay. The dental professional noted that her gums did appear healthier than her last recare appointment, and Jennifer decided to continue with another cycle of therapy products (CTx3 Rinse and CTx4 Gel 1100). 2/20/12: Jennifer came in for a caries reassessment appointment. She had continued running, eating, and drinking at elevated levels, including 5 small meals per day with one snack and 10–12 energy drinks and 3–4 energy packets per week while working out. Her CariScreen score was 1544, and while her score was still elevated (above 1500), her dental professional was glad to see her moving in the right direction and was less concerned about her caries risk. Jennifer’s dental professional suggested that Jennifer switch to a slightly different rinse that did not contain an antibacterial ingredient but still contained pH neutralization, xylitol, and fluoride (such as CTx3 Rinse) and continue the toothpaste/gel with 1.1% neutral sodium fluoride, xylitol, pH neutralization, and nanoparticles of hydroxyapatite (such as CTx4 Gel 1100) 2 times daily. As Jennifer’s lifestyle will continue to include risk factors, her dental professional informed her that in order to avoid decay, Jennifer would need to continue using additional protective factor pH neutralizing products with xylitol, fluoride, and remineralization agents for as long as her risk factors were present (such as CTx2 Spray or CTx2 Xylitol Gum). 1/21/11: Amelia is a 23-year-old female with little dental history. She has not seen her dentist in 3 years and, 3 years ago, was a new patient who had no cavities or problems at all. She has recently started a job that includes dental insurance and has scheduled a cleaning appointment. During her caries risk assessment, she only self-reported that she sipped drinks other than water more than 2 times daily, but only on healthy drinks like tea and juice. Her CariScreen score was 622, but she had 4 new cavities visible on her x-rays; and during her examination, the dental professional noted it appeared Amelia had not been regular with her home care. Her dental professional was shocked her CariScreen score was so low. Amelia did not seem very forthcoming with information on her risk factors and said she only wanted what her dental insurance would cover. Her dental professional shared that they were there to help her in any way they could and that their goal was to help her improve her oral health. Amelia chose to decline any professional/prescription therapy products and scheduled the fillings covered by her dental insurance. 2/6/11: Amelia returned for her fillings, and her dentist noted her saliva did not seem normal and was thick and sticky. The dentist inquired regarding her risk factors and CariScreen score and asked her if there was anything else going on in her life that could be affecting her diet or if she felt like she had a dry mouth. Amelia again chose not to share any risk factor information with her dentist. 7/19/11: Amelia returned for her 6-month recall visit, and she did not self report any other risk factors other than her frequent daily drinks of tea and juice. Her CariScreen score was 536, and she had one new cavity that needed restoration, a couple small new lesions forming, and as some recurrent decay around one of her previous fillings. Her hygienist inquired as to why Amelia liked to have liquids to drink so frequently. Amelia informed her hygienist that she kept them close because she felt like her mouth was dry sometimes. At this point, her hygienist pulled out Amelia’s caries risk assessment form and went through the risk factor list, covering each question thoroughly but without judgment, knowing something was missing. Amelia was initially resistant, but as the hygienist continued to ask open-ended questions, Amelia began to share and the dental team discovered that Amelia was actually on 4 different medications for depression, anxiety, and back pain that she took daily. Amelia was initially resistant to share her medications as she didn’t feel they were important to her dentist and felt embarrassed about the medications she was taking. During a visit to a local medical clinic a year ago, she had been treated like a “drug seeker” and was tired of feeling judged. She was working hard and was taking care of her mother and little brother and felt that few medical professionals took her seriously. It took her dental team time to build enough trust for her to share some risk factors that were making her more susceptible to dental decay. 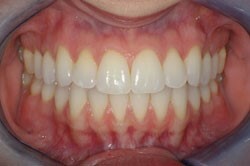 After understanding the underlying cause of her susceptibility and the options she had, Amelia had an in-office fluoride varnish and chose to begin using a professional rinse and toothpaste/gel with pH neutralization, xylitol, fluoride, and nanoparticles of hydroxyapatite at home (such as CTx4 Treatment Rinse, CTx3 Rinse, and CTx4 Gel 1100). 10/12/11: Amelia returned for a 3-month recall check to assess how her therapy was working. She was still taking the 4 different medications and experiencing dry mouth. She was also still frequently sipping tea and juice. Thankfully, her early lesions identified at the previous visit were showing signs of remineralization and all of her restorations looked great. Due to her low saliva flow, it was important that she continue with a maintenance program of pH neutralization, xylitol, fluoride, and nanoparticles of hydroxyapatite; and Amelia chose to stick with using the professional rinse and toothpaste/gel with pH neutralization, xylitol, fluoride, and nanoparticles of hydroxyapatite daily. To date, Amelia has shown no new decay. 7/12/11: Jerome is a 17-year-old high school athlete. He has had numerous problems with decay in the last 3 years. His first caries risk assessment revealed that he only had one risk factor: drinking liquids other than water more than 2 times daily. 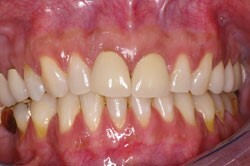 He had excellent oral hygiene habits and was brushing with an electric toothbrush twice daily as well as flossing daily. He had a CariScreen score of 989 and 4 new cavities as well as some other early lesions the dentist wanted to keep an eye on. He shared that he very regularly consumed diet sodas as well as diet sports drinks due to his daily sports routine and had basically stopped drinking anything else during the day. His dentist explained how both diet sodas and sports drinks were extremely acidic (pH 2.5–3.3). The regular bathing of Jerome’s teeth in acid and some sugars (in the diet sports drink) were causing even the low level of bacteria on his teeth to cause cavities. He said he would try to limit the diet soda and drink more water during his physical activities. He chose to be conservative with his home care program and replaced his toothpaste with the one the dentist recommended that had 1.1% neutral sodium fluoride, pH neutralization, xylitol, and nanoparticles of hydroxyapatite for remineralization (such as CTx4 Gel 1100). 2/2/12: Jerome returned for a 6-month checkup, and his caries risk assessment revealed the same risk factor of liquids other than water more than 2 times daily. His CariScreen score was 1027, and two of the areas the dentist had chosen to watch previously now had decay that needed restoration. But Jerome had two other spots that appeared to have partially remineralized. He shared that he had cut out most of the diet soda but was still consuming 4–5 diet sports drinks on a daily basis. He had a couple of choices: He could choose to keep his same home care program and sports drink consumption and continue getting cavities; although he had slightly less this time, he was still showing signs of the disease. He could choose to increase his home care regimen, which included both prescription toothpaste/gel and a professional oral rinse with pH neutralization, fluoride, xylitol, and nanoparticles of hydroxyapatite for remineralization, or decrease his sports drink consumption. He chose to up his home care program and said he would try to cut back on the sports drinks. He and his parents were tired of all the new cavities, and he really wanted to look into orthodontics and whitening. But his parents said that they weren’t going to pay for any cosmetic dental work until he stopped getting cavities, and his dentist agreed. Adding orthodontic brackets to his teeth would just increase his risk at this point. Jerome’s dentist wanted him to come back in 3 months when his home care kit was gone and reassess if the new therapy program was enough to get him under control. 5/22/12: Jerome came back in for his 3-month reassessment, and his CariScreen score was 416. His dentist noticed multiple areas of remineralization on his teeth, and he had no new cavities. Jerome explained that he had been extremely vigilant with his home care program of rinsing and then brushing but had actually increased his diet sports drink consumption. He also explained that he had taken the dental hygienist’s advice, and whenever he drank the sports drinks during his athletic events, he drank them quickly and then did a quick rinse and spit with regular water to get the liquid off his teeth. This method had reduced the amount of acidic exposure to his teeth. Combined with the increase in protective factors he had, for the moment, found a balance. His dentist said he should keep up his program, and they would revisit his desire for orthodontics and whitening in 6 months if his balance was maintained.